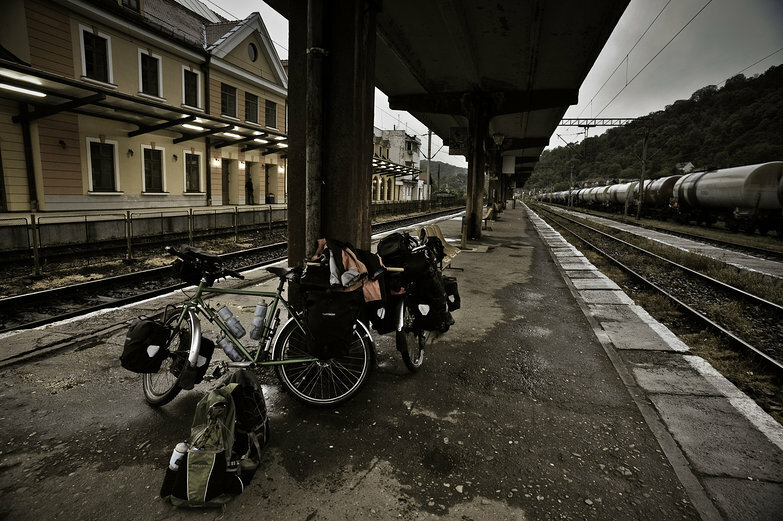 After a long, cold, wet, hilly day of cycling, we arrive in Sighişoara and head directly to the train station. Tyler goes in to ask about tickets to Munich, while I stay outside to guard the bikes. I am soaked and shivering, cupping my hands over my mouth and blowing into them hard. A gypsy boy looks on in awe. He approaches and tentatively touches his hand to mine; his feels warm. His eyes bug out, and he says something like "whoa!" and begins to back away as if my cold will contaminate him. Tyler returns, with the news that the train would leave at 8:50 PM, and that we'd have to switch to another in the middle of the night in Budapest. Tickets will cost approximately 880 lei (roughly $260 USD), and the women working there are unsure if we can bring our bikes aboard. They say the conductor will let us know. Unsure? They work there, they should know. I go in to get some clarification. My efforts are futile: the workers are exceptionally unhelpful, they don't seem to know anything about trains. Giving up on the certainty of our train, my priorities shift. I am wet. I am cold. I need to change clothes. While Tyler watches the bikes, I make my way to the station bathroom, clutching an armful of my clothing bag, dry sandals, and loose odds and ends. I am about to enter a stall, when I find that a creepy, stubbly man who followed me down the hall is right behind me. He stops me, insisting that I pay one lei for the privilege of using his bathroom. One lei, one lei, he demands, pointing at a faded post-it note stuck to the door with some unintelligible writing scrawled on it. Feeling irrationally furious, I storm off and head back outside, where I rifle through the handlebar bag until I find a single lei, my dry clothes getting wetter with each passing second. I come back and make my way into the dingy bathroom where I fork over one lei resentfully to the restroom guard. In a small stall, I slowly change clothes, trying not to let any part of me touch the walls. The toilet is a clog of brown sludge; I close the lid with a bang and a shudder, and set on top of it each of my wet clothes as I peel them off my body. The floor is gross; I am standing barefoot on top of my shoes, hoping I can manage this whole process without having anything touch the pee-stained linoleum. But of course one sopping sock falls off of the toilet seat, slowly dragging with it the whole pile. Before I can catch the avalanche, my clothes are on the floor, soaking up all kinds of grossness. I curse everything and hate my life. Clammy and wrinkled, I use my "comfy pants" (our slang for the pants we sleep in) as a towel to dry off as best I can before putting on a new set of clothes. It is mostly futile. My dampness infects my dry clothes. It is cold outside, so I'll have to bundle up. My rain coat is wet, my purple jacket is soaked up to the elbows, my long underwear is wet, and my beloved hoodie was accidentally shrunk to unwearable levels last time we had access to a drier. With a grimace I pull on my purple jacket, and head back outside where it is still raining. I hide under the train station roof overhang, keeping an eye on the bikes from the safety of somewhere dry, while Tyler goes in to purchase tickets. He comes back without them, saying we must withdraw more cash, as they don't take credit cards. I roll up my pant leg, give up hope on ever being warm or dry, and we cycle to the center of town to find an ATM. After a short, splashy ride, we locate an ATM and withdraw cash. At this point I am so cold that I'm shivering uncontrollably, and only marginally drier than I was before. I want nothing more than to end our running back and forth, and settle into a coffee shop for the remainder of our wait. But, we want to get the ticket situation taken care of, so back to the train station we go. More waiting with the bikes, more cold, more rain follows. Tickets purchased, we cycle back to the center of town in search of a coffeeshop where we can spend the remaining hours before the train leaves. One cafe, called "the Aristocrat" looks far too fancy to accept two bedraggled cylists like ourselves. Another looks just right, and we settle in with a cappucino and a hot chocolate. Later comes an omelet and a plate of sausages. Food helps the situation, but I am still wet, and freezing gusts of air blow in every time the door opens, robbing me of what little warmth I've gained. We manage to get online and get some work done. Miraculously there is free wifi coming from somewhere, and even though my laptop's wireless receiver is often too weak to be useful, I have a full signal too. Tyler won't have to drag out a network cable and configure internet sharing! I Skype with my family. 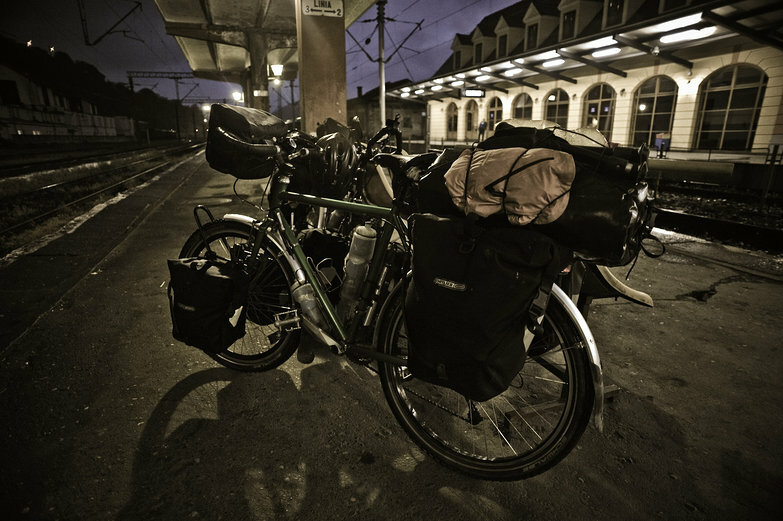 We leave the coffee shop, and ride our rain-covered bikes once more to the cold, drafty train station. While we wait for our train to arrive, I work on the warm hat I'm knitting for Tyler's dad. It will probably be ready just in time for a hot Minnesota summer! In preparation for our train, we get up and begin to collect our belongings. The woman sitting nearby in her office makes motions for us to sit back down. It's twenty minutes late, she says. We do as we're told and wait some more, chilly by a drafty window. We get up for real this time, wearing our backpacks as we head outside. We unlock our bikes, and wheel them towards the train track. When the train comes, we will be ready. A bright point of light appears in the distance. We watch as it rolls in, churning and screaming, metal against metal. Everyone rushes to a door in a carriage further along, but we wait for the train to stop right in front of us. There is a man blocking the open door, holding the handrail and hanging slightly out of the train. We make motions to get on and he responds with a wag of his finger. "No bikes on train. No bikes. Not possible. ", he says curtly. There is scarcely time to protest, plead, or offer to pay some sort of fine. We watch in horror as our train starts to to move. The nonchalant conductor dismisses us with a shrug, and our train slowly pulls out of the station, leaving us behind. Tara waits on the platform while I return to the station, hoping to figure out what just happened. 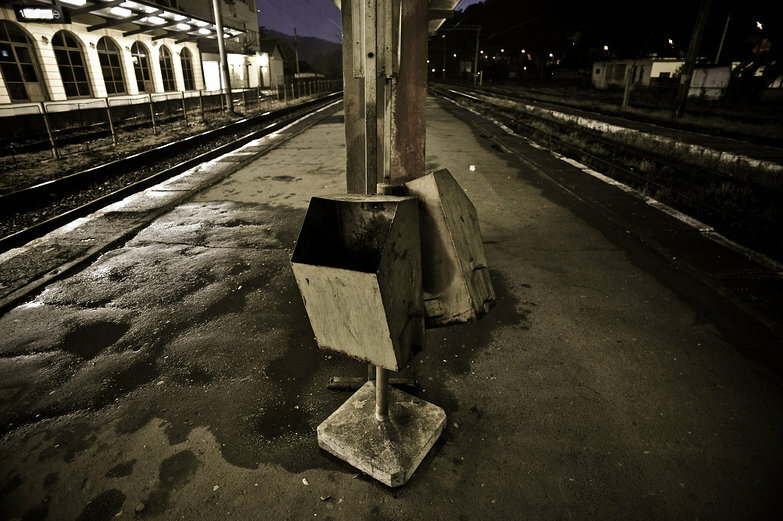 At the ticket counter, I explain how the conductor of our train said we couldn't board. In response, two women in their plexiglas-shielded room shrug, barely making eye contact as I calmly and persistently ask for help. Both of them seem extremely uncomfortable with the fact that I am not going away, visibly grimacing every time I speak. Since it is looking like I won't be getting any help, I ask if it is possible to get a refund. The word "refund" seems to be some kind of a magic word; as soon as it leaves my mouth, both of the women finally engage, repeatedly shrugging and insisting that this is impossible. Now that I have their attention, I explain that I don't really want a refund, that I just want to board a train in the direction of Munich. Their response is another infuriating round of shrugs. Either they have no idea how to help, or they are uninterested in doing so. As I resume asking for a refund, one of the women picks up a giant batman-style red phone and whispers something into it, cupping her hand over the receiver. A few seconds later, a station agent appears. He tells me that there is a train to Vienna in a few hours, and that he'll talk to the conductor and help us board. Success! Now we're waiting in the chilly, drafty station, our bikes locked up outside. I am cold, and I am wet, lying on an uncomfortable wooden bench that jabs me in all the wrong places as I try in vain to get some rest. Tyler is working on his laptop, fixing something or other for a client. He stops just long enough to get me his long underwear from our bikes outside. Thank you, Tyler! Hours after I have changed into dry clothes, I am still cold. I want a blanket. I want my hoodie. I want a comforter. I want a bath. I want a fluffy towel. I want to be in bed, I want I want I want. 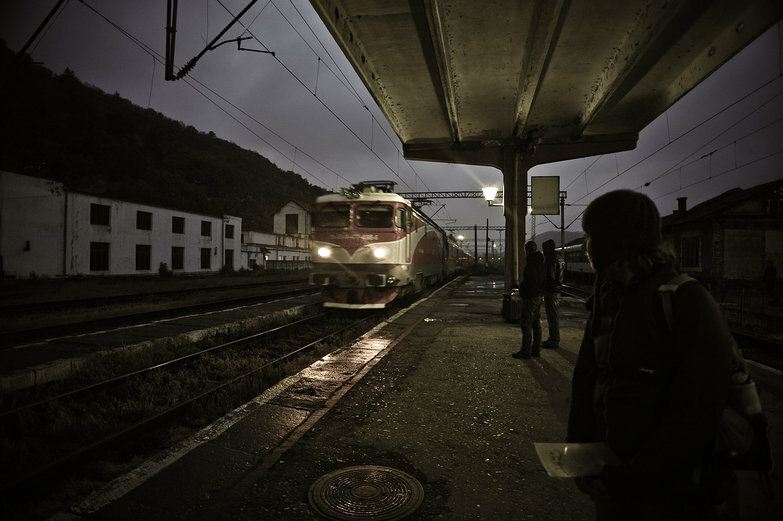 But instead I am sitting in a train station in the middle of nowhere in Romania. This is why we want a car to cross Siberia with. We don't have six months to cycle it and relying on trains in Russia is, frankly, not an option we're willing to consider. Bikes + trains = awful. And this isn't even that bad. Multiply this by eight thousand, and then by however many times we're going to want to get off and explore some village or town. No way. But I know you're having a once in a lifetime experience.. and this specific one will help you (and I) be more thankful for the warmth and comforts we can afford. What is it about trains? Buses too. USA Amtrak is a pain. SF Bay Area BART thinks it gets awards...but only if you compare it to downright unfriendly systems, IMO. Spain was weird in all sorts of ways. At one point one train broke down in the middle of nowhere, and it turned out I was just lucky that the next train allowed bikes! And, yup, the 'helpful' employee story, I recognize that one too. One woman at a bus station turned into my personal ambassador, much to the disgust of the bus driver who did not have to deal with the bike and had a half empty bus! By the end of my sojourn aboard his coach he was all smiles, and you'd a thought he invited me and the bike along! But, OMG, nowhere near your wet and cold story. I send hot soup wishes for the rest of the journey!